Just off the Natchez Trace Parkway, near the place where that historic road moves from Tennessee into northwest Alabama near the Shoals, is a man-made wall commemorating a moving story of the “Trail of Tears.” The “Trail of Tears” was an aftermath of the Indian Removal Act of 1830, the episode of American history which forcibly removed Native Americans from their homes in the east to the Oklahoma territories. 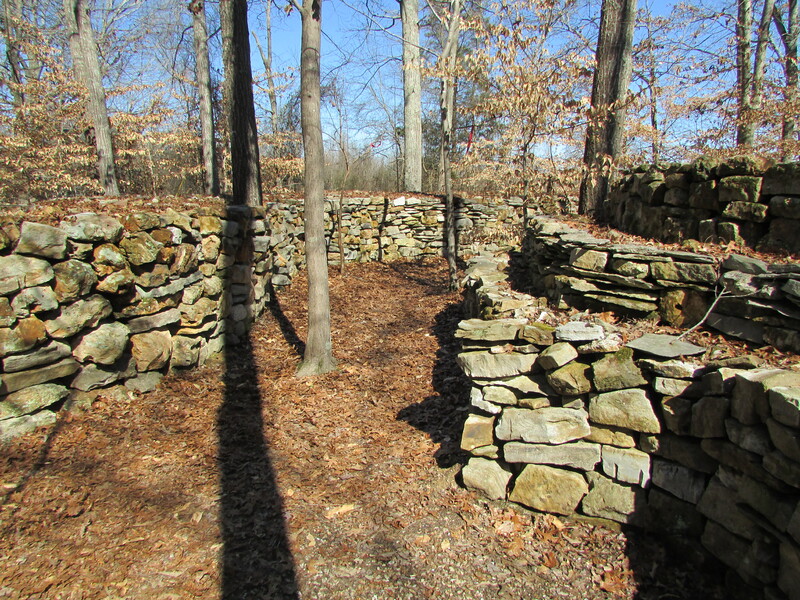 Tom Hendrix has built a monumental stone wall to honor his great-great-grandmother, Te-lah-nay, a member of the Yuchi tribe, who walked with her sister and others from her home near the Tennessee River – the Native Americans called it “the Singing River” – to Oklahoma. According to family lore, the young woman was disappointed to find that the waters of Oklahoma did not sing and resolved to walk back to Alabama and her “Singing River.” The journey home took five years. Mr. Hendrix, who is now in his 80s, has been working on the wall for over thirty years. It is estimated that there are 8.5 million pounds of stones in the project. It is reputed to be the world’s longest memorial to a Native American and to a woman. It is the longest non-mortared rock wall in the United States. Mr. Hendrix, the maker, says that it honors not just his great-great-grandmother Te-lah-nay but all Native American women. 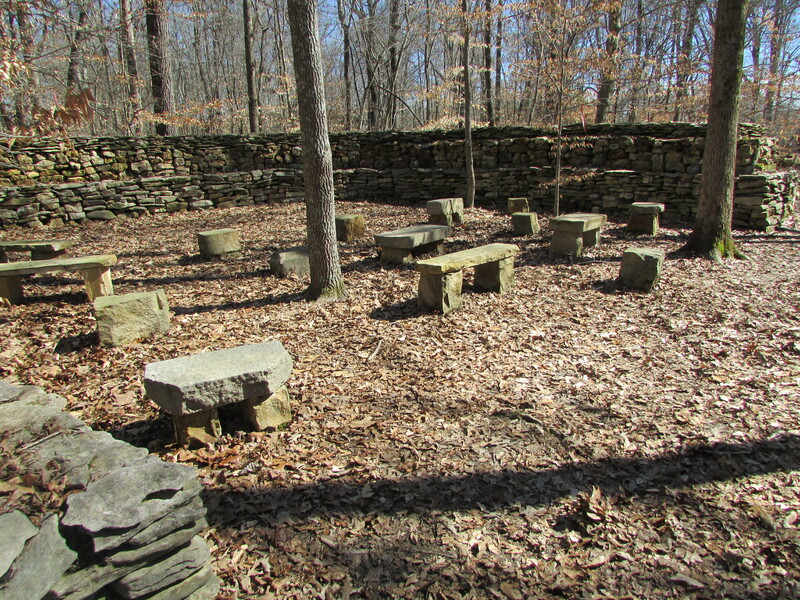 Mr. Hendrix, inspired by the stories and journals passed down through his family, began to build the wall with stones he had brought to the site at his home a few yards from the Natchez Trace. Each stone, he says, represents a step of Te-lah-nay’s journey. 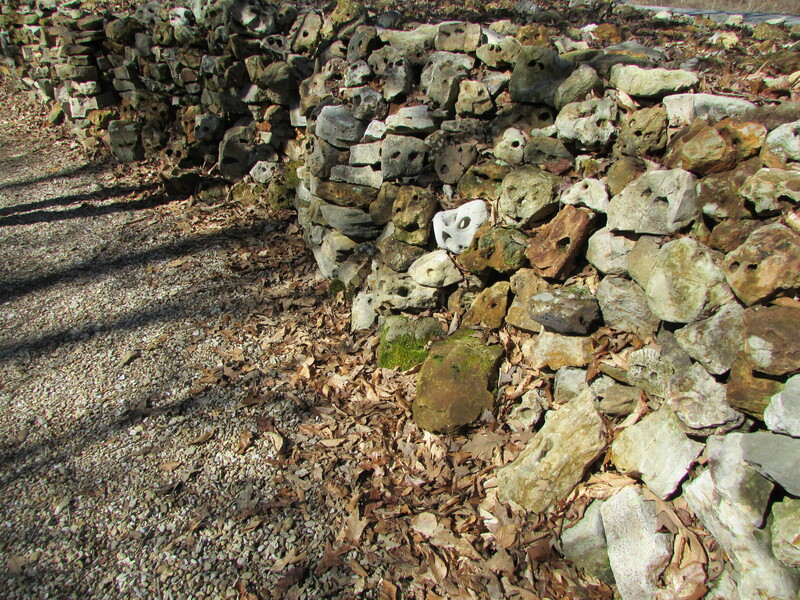 Now there are paths along well over a mile of wall, each stone placed by Mr. Hendrix. 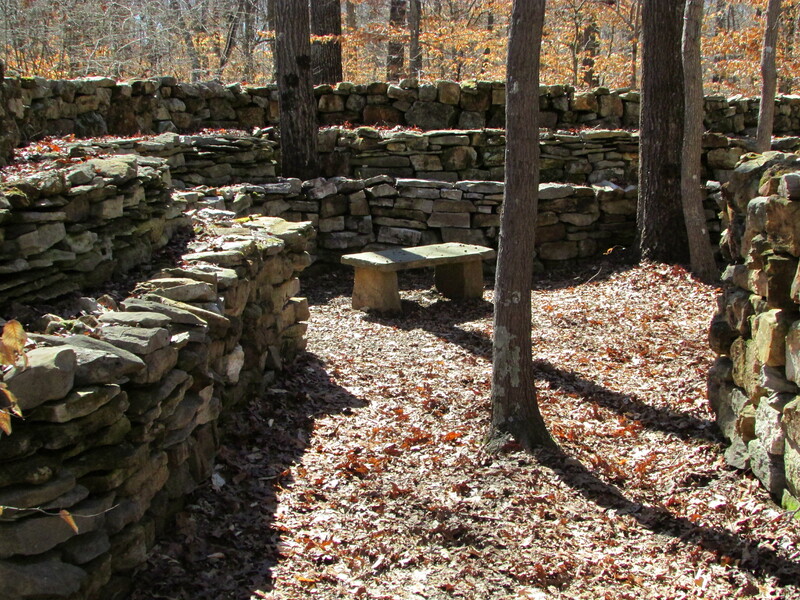 It is a spiritual and peaceful place with curves, benches, levels, and prayer circles. 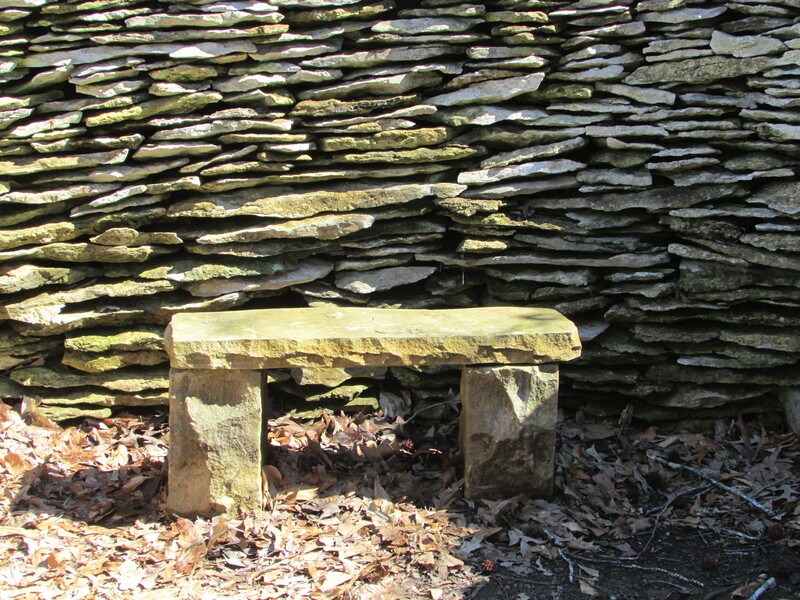 At some places the wall is high and at other places it is low enough to sit on. At some places it is tight and closed in and at others it opens out. People have sent stones to Mr. Hendrix from all over the world to be placed in the wall. 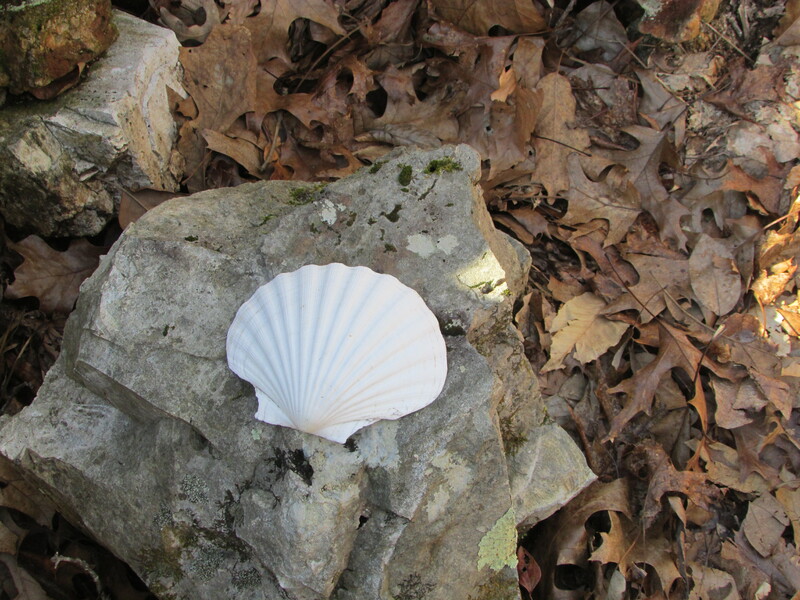 Occasionally a seashell appears along the path. When I arrived on a warm late winter afternoon in mid-March, Mr. Hendrix greeted me. From his driveway, there are paths going in either direction. He told me the path to the left represents Te-lah-nay’s walk to Oklahoma and that the path to my right represents her return home. I asked which one I should take first and he said it didn’t matter. I chose the path to the left. Taking the path to the right, I soon moved along a wall of rocks with what appear to be spirits peering out. 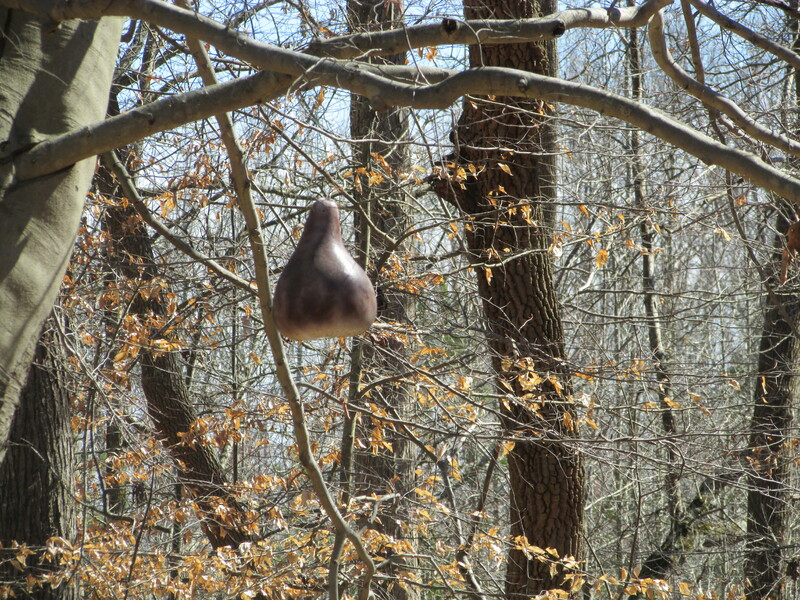 Continuing along the path, there are openings, areas of benches and congregation, a single gourd hanging from a tall tree. I was a short distance from the first path, but the feeling was much lighter and more free. At times the wall meandered off and the sunlight through the still bare trees glistened and darted in the slight breeze. Again I sat on a bench in the path and this time I relaxed and stayed for a while. When my journey along the wall was complete, Mr. Hendrix was there to answer questions and explain. He has written a book about Te-lah-nay’s journey called If the Legends Fade and copies are available for sale at the site (www.ifthelegendsfade.com). Also available are stone carvings by Mr. Hendrix including spiritual images, images of animals, and benches and birdbaths. 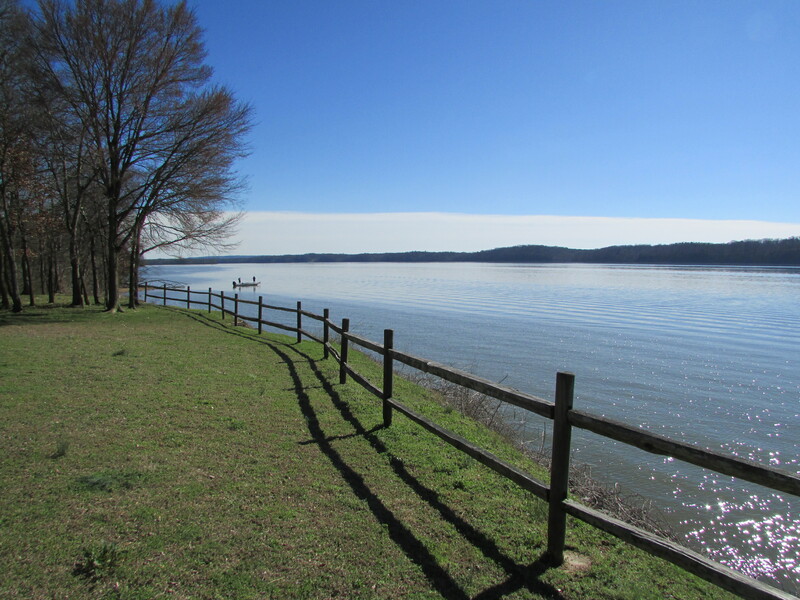 I asked him how far the site is from Te-lah-nay’s “Singing River” and he directed me nine miles southwest to the place where the Natchez Trace crosses the Tennessee. It is a lovely and peaceful spot and the river is wide there. Mr. Hendrix says that the song from the river is more faint now that the river has been tamed and industry crowds much of its shores. But there is no sign of these things at the spot where the Natchez Trace bridge crosses the water; Mr. Hendrix says he still hears the river’s song almost every day. This entry was posted in Natchez Trace Parkway, Tom Hendrix, Wichahpi Commemorative Stone Wall and tagged Alabama, culture, If the Legends Fade by Tom Hendrix, Indian Removal Act of 1830, Natchez Trace in Alabama, Native American culture, Tennessee River, the Shoals, The Singing River, the south, Trail of Tears, travel, Yuchi on March 19, 2015 by gedwardjourney.